When I was a kid, I always used to think, is there a need of clutch ? what does it do exactly ? & as a kid I was able to imagine the working of brakes & how does the speed increase but I was never able to understand clutches ! It was truly a satisfying moment for me when I was completely able to understand clutches. So here it is, today we’ll see everything you need to know about Clutches ! Clutches are mechanical devices for engaging & dis-engaging the engine & transmission system of the vehicle at the will of the operator. An illustration giving a basic idea on clutch ! 1. Flywheel – The flywheel, mounted on the crankshaft, keeps on running as long as the engine keeps running. The flywheel is equipped with friction surface OR a friction disc is bolted to outer side of flywheel. 2. Friction discs – Single OR multiple(as per requirement) discs lined with friction material having high coefficient of friction are mounted on the driven shaft. 3. Pressure plate – Another friction disc is bolted to pressure plate. The pressure plate is mounted on the splined hub. 4. Spring & release levers – The spring used are diaphragm springs which moves friction disc back & forth. The spring is retracted with the help of levers. The principle behind working of clutches(friction) is that no torque/power gets transmitted until both the friction plates touch each other. 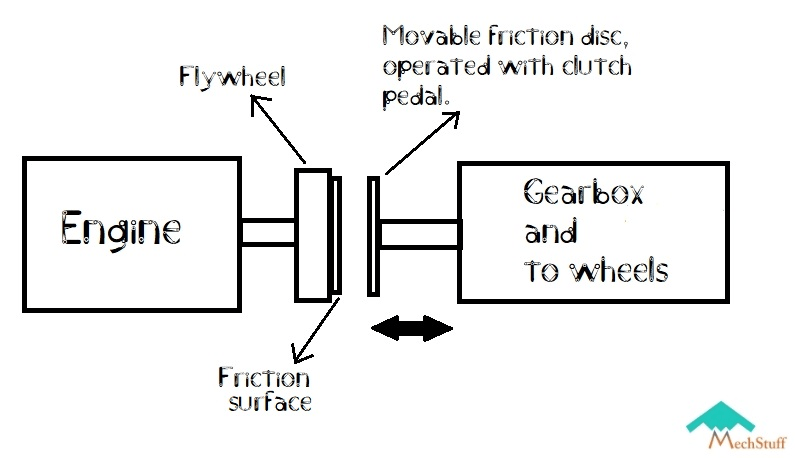 One friction plate is bolted to flywheel & the other is movable over the crankshaft. The amount of torque delivery depends on how much the axial load is applied on the friction disc. The movable disc is splined on crankshaft & is able to move back and forth with help of clutch pedal. when Load= max spring force, power transmitted= maximum ! Load is applied by the pressure plate since the pressure plate is connected to multiple helical springs OR single diaphragm spring ! Engagement & disengagement of clutches ! When we completely press the clutch pedal, the movable friction disc slides back on the shaft. This is the disengaged condition in which the friction doesn’t touch the flywheel. Which means that the axial load applied by the pressure plate is 0 & hence power/torque transmission is 0 ! Note that the engine is still running but the vehicle won’t move ! When we completely release the clutch pedal, the movable friction disc slides forward on that shaft. This is engaged condition in which the disc has completely touched the flywheel. Which means that the axial load applied by the pressure plate is max spring force & hence power transmitted is max ! When 0 < Load < max spring force, a condition called as slip condition occurs. Lets say, there is a 50% slip condition; this means that only 50% of power is going to be transmitted ! The percentage of slip depends upon how much clutch pedal you’ve pressed ! Why worn out clutches deliver low power ? The axial load applied by the pressure plate depends upon the deflection of the spring. More the deflection, more the force. When the discs wear out, the spring deflects lesser than the initial deflection. Hence, due to this, the spring is able to apply lower axial force than before which results in poor power transmission ! This directly affects the efficiency of the vehicle & so clutch plates must be changed accordingly ! Why do we need clutch ? Lets understand this with the help of an example where a man needs to carry 100 kg of load from point A to point B. Suppose the whole 100kg is directly given to man at point A. Result – The man will fall down because he cannot handle so much load in an instance. When the man is at A in the beginning, only 5kg given to him . He then starts walking towards B since he could easily carry 5kg. Hereafter, 5 kg is added after every 1m of distance. So after 1m load, he would be carrying is 10 kg; after 2m, load will be 15 kg & so on. Result – The man will reach his destination; if not point B at least he will be able to carry it for a longer period than Case A. We conclude that, the man is unable to handle a heavy load which is applied suddenly whereas he could carry it for long distances if the load increases uniformly applied ! Same is the case with machines & vehicles; motor/engine cannot handle such a heavy load applied in an instant. Hence clutches are used to increase load uniformly so that engine keeps running & your vehicle starts moving. CASE A is an illustration where a person starts learning a vehicle & releases clutch immediately due to which engine cannot handle so much load & stops running, giving person a jerk. while CASE B is how a car driver drives a car ! The main reason why we need clutch is that it permits the engine to run even when the vehicle is not moving ! Brakes & types of brakes in detail(animations) ! How does a differential in a car work ?